We finally made it to Switzerland! After traveling all over Europe we had avoided traveling extensively in Switzerland. The main reason being that Switzerland is one of the most expensive countries in the world to travel in. However, the iconic Alps were calling us – so we bit the bullet. 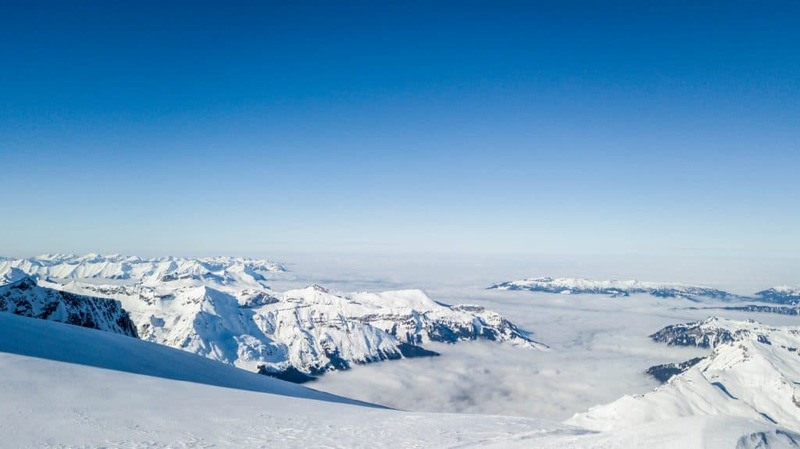 We love to snowboard so it’s only natural we head to Switzerland while venturing around Europe. Switzerland is well known for it’s access to the Alps and world-class ski resorts. Our first stop in the country was at the heart of Swiss tourism, Grindelwald. Grindelwald lies in the Jungfrau region and is only a short train ride up from Interlaken, the stomping ground and adventure capital for almost every tourist in the country. 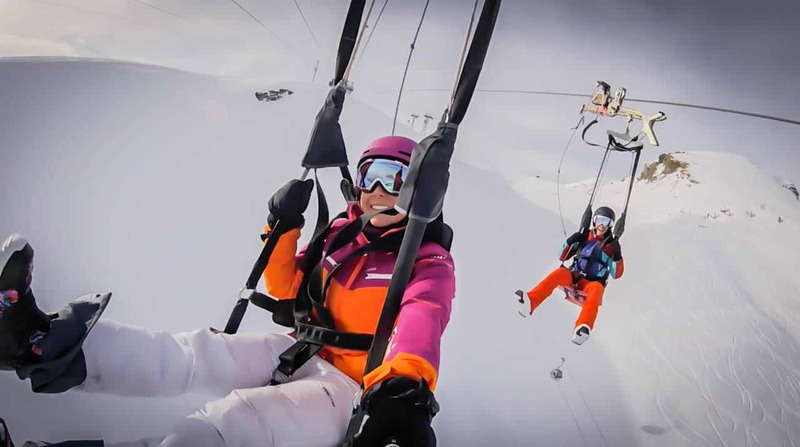 Switzerland is a lot more than just stunning vistas, it’s also an adventure sports hub. There are plenty of adventures to be found in Grindelwald, Interlaken, and the greater Jungfrau region. Its primed for adventure sports and those looking to explore the spectacular mountain range. 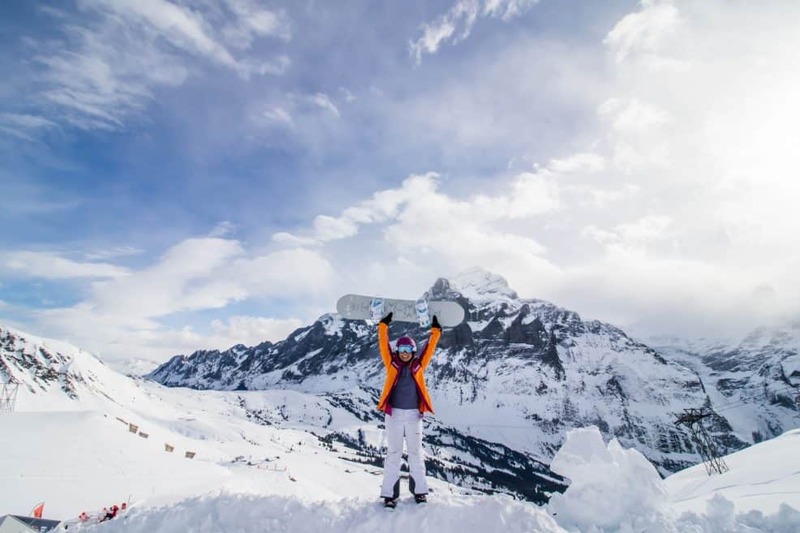 Here are our favorite things to do in Grindelwald in the winter. We set up our base as Grindelwald as we came for snowboarding. The little mountain village provides perfect access to two ski areas and numerous hiking trails. High above Grindelwald lies to the Bernese Alps, and a famous mountain face. That mountain is Eiger’s notorious North Face – yup the clothing company you have probably heard of is named after a mountain in Switzerland. The village has a long main road and plenty of accommodation options to handle a large number of tourists that make the journey up the valley from Interlaken. 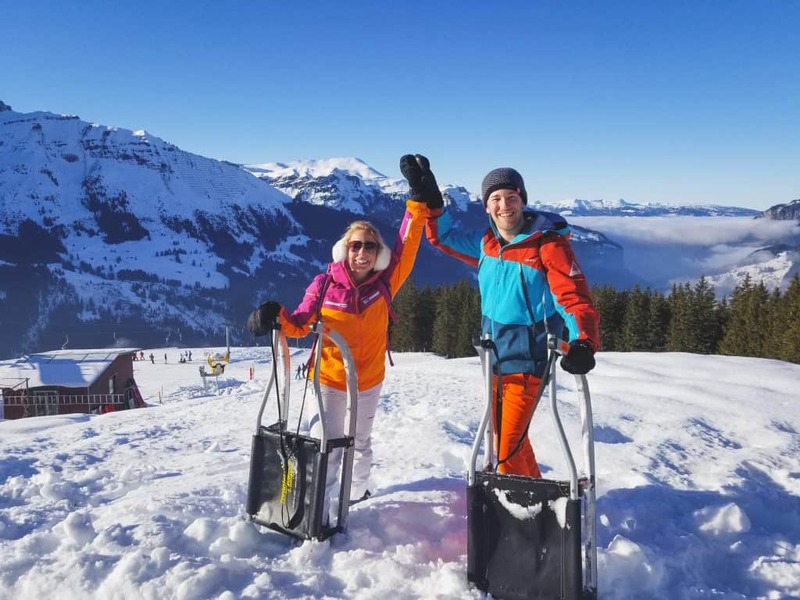 The village lacks the charm that the surrounding villages have such a Gimmelwald, Murren, or Wengen, but it does provide amazing access to the mountains. However with the plethora of accommodation it’s possible to find a good deal on a hotel room for the night. Our first day on the mountain we took the gondola up to Grindelwald First. Grindelwald First can only be accessed from the village and it provides stunning views of Bernese Alps. The gondola is the only way up to the mountain unless you’re looking for a long hike, popular in the summertime. The North Face of Eiger was shrouded in clouds and we were afraid we would face the same fate, but as the sun rose the clouds dissipated and we were treated to the amazing views of a stunning mountain range. Get Discounted Lift Tickets Now! 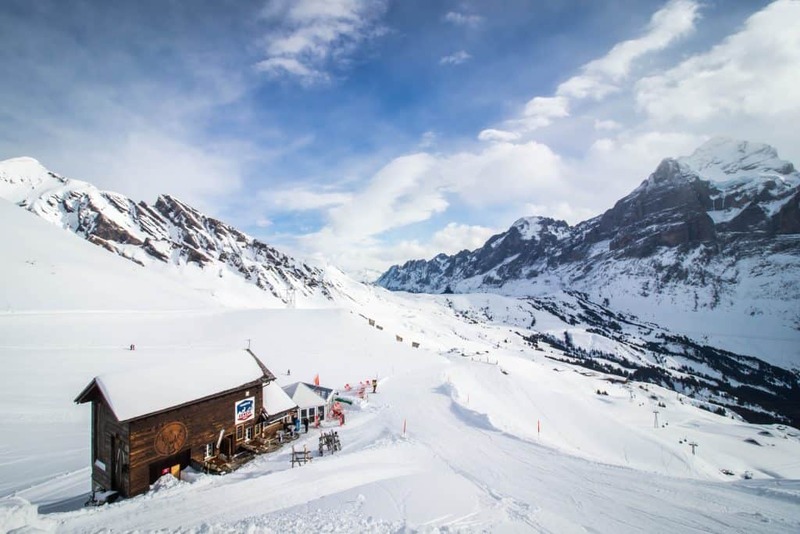 Grindelwald First is most popular with snowboarders as the area has two snowparks – a beginner run off of Oberjoch and the larger White Elements freestyle park, also a superpipe at Shrekford and a terrain park near the Bargelegg lift. 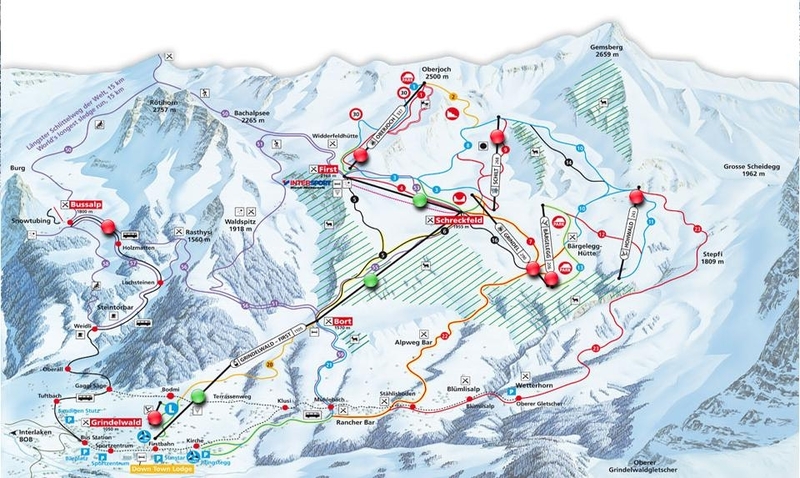 The central ski area has around 100km of ski pistes and the vast majority of them are rated as intermediates. There are a plethora of long intermediate runs. 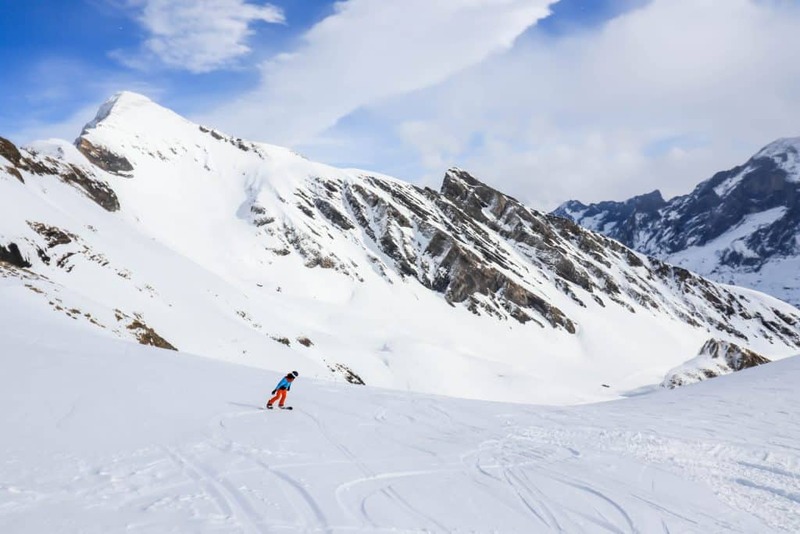 It’s really great for families or novices not looking to tackle some of Switzerland’s massive ski resorts. It’s the largest section of the ski area and you get the unique opportunity to take a train back up to the mountaintop from three different rail stops along the mountain. We didn’t get to explore this village on our trip. It’s well known for being a quaint and beautiful village with amazing views of the Lauterbrunnen Valley. The resort has a number of challenging runs but is small in size. Most notably it is credited with being the birth of modern skiing and held the first slalom race ever in 1922. Our first evening in the region we tried something unique to only Grindelwald, the Velogemmel. You’re probably wondering what a Velogemmel is because we were too on our arrival. A Velogemmel is a wooden bike with two small sled edges instead of tires. It’s a crazy idea that was initially designed for the local postmen going door to door years ago. An idea that tourists and locals are more than welcome to try themselves. 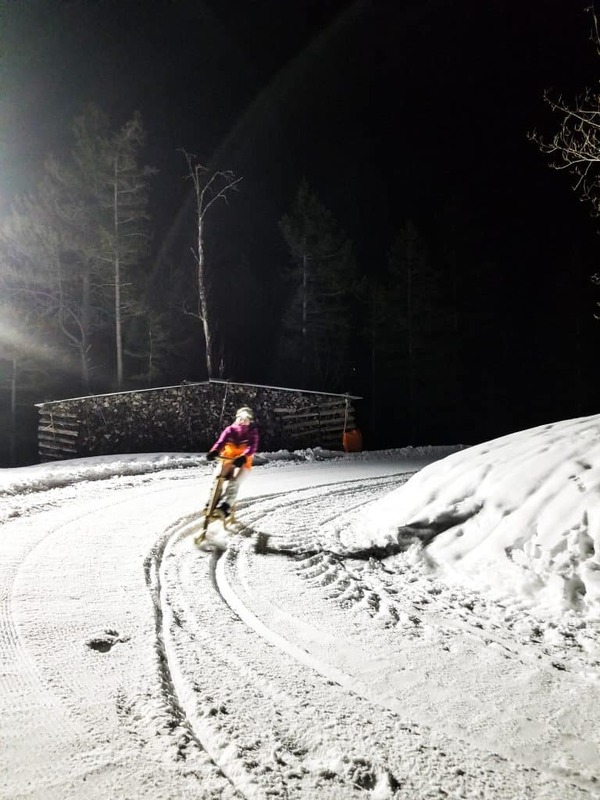 We had a blast riding a wood bike down the sledge run at night. It’s also not too hard on the legs so if you’ve already been skiing on the mountain it’s a fun nighttime activity for friends and family. 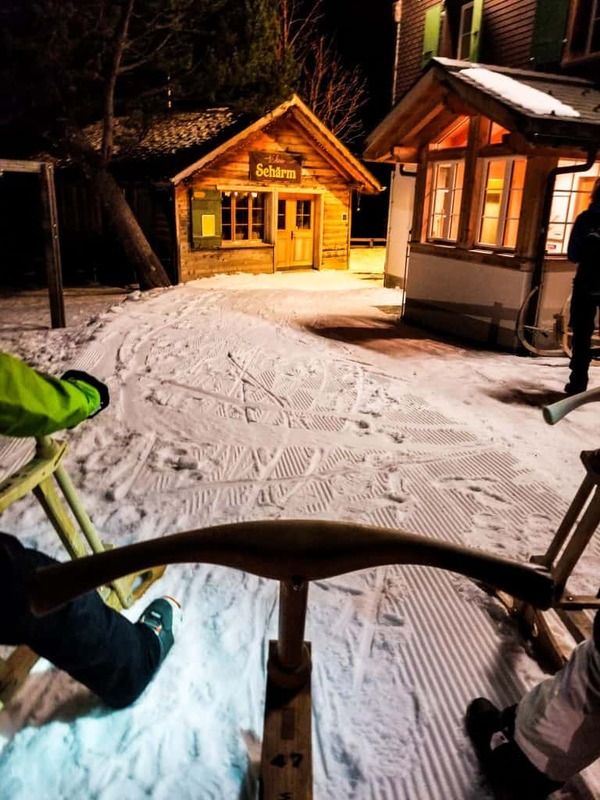 The “bikes” can be rented during the day or night to be used on the sledge trails from the train station. We’ve seen a lot of cool things included in our lifts tickets while skiing, but the First Flyer is a one and only. Riders are given two options to be strapped in and hurtle down an 800-meter long zip line. You can either opt for the classic harness in which you sit upright, or hang like an eagle above the mountain below. The advantage of riding the flyer in the winter is almost no lines. We haven’t seen it during the summertime, but I imagine it draws a bit more of a crowd. 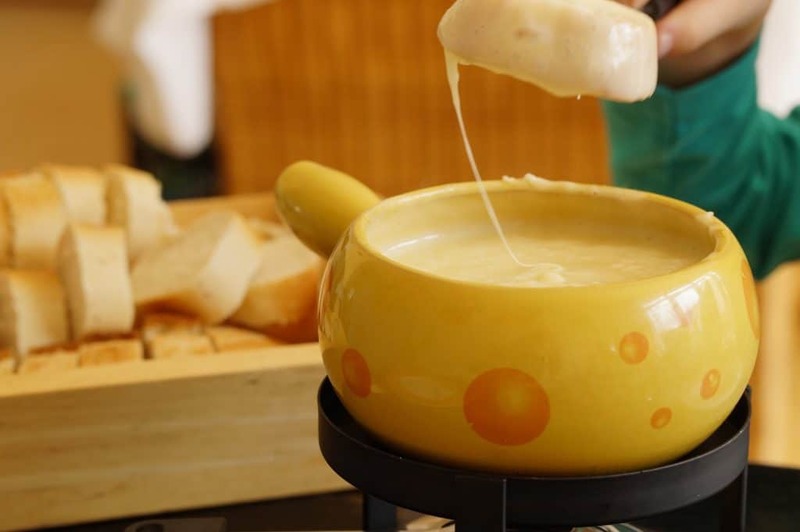 There could not be a more fitting place to give fondue a try than in the Swiss Alps. Fondue in Switzerland is a rite of passage and one of the most traditional forms of dining. It’s possible to find fondue in the summer season for tourists, but it’s actually a winter tradition and dish. If you’re not familiar with fondue it’s fresh local cheese melted into a large communal pot that you dip small pieces of bread. In America, we have our own version that uses different meats and vegetables, but in Switzerland, you use strictly bread (and a few drinks with great company). This car-free village is a popular stop year round. It sits above the neighboring Lauterbrunnen valley and offers jaw-dropping views out to Switzerland’s tallest waterfall. It’s a charming village that is buzzing with people in the winter looking to hit the slopes. In summer it serves as a relaxing oasis to soak in the beauty of the Alps. 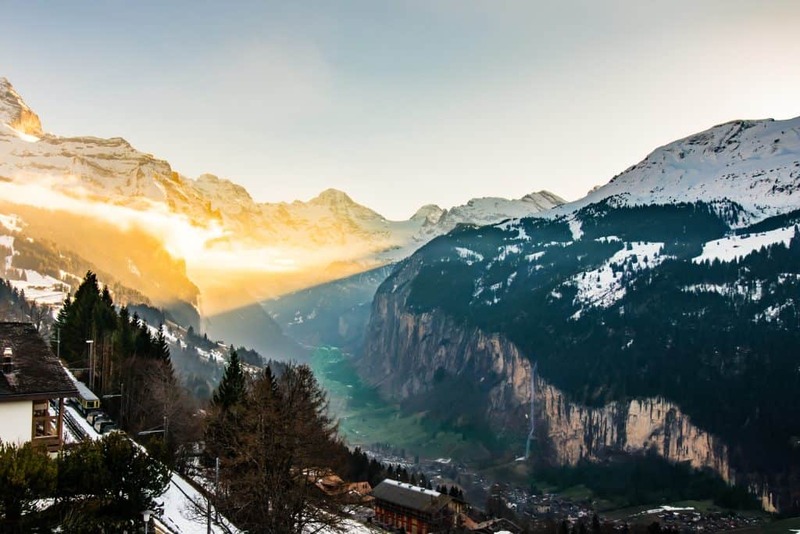 From Wengen, you can hike down to the valley or up to the mountaintops. A highlight of the winter is the world famous Lauberhorn World Cup Race. Its origin goes back all the way to 1930 and it is the world’s fastest and longest downhill race. The world famous run includes a cliff jump in which skiers fly through the air up to 60m. It draws a massive crowd and is sure to be a spectacle. Just make sure to book in advance as tickets and accommodation are usually sold out. We’re starting to get the hang of this one! If you aren’t big on skiing or snowboarding then the area of Jungfrau just may be the world capital of sledding. You can even take the world’s longest sled run here! Covering 15km the run drops nearly 1600m! 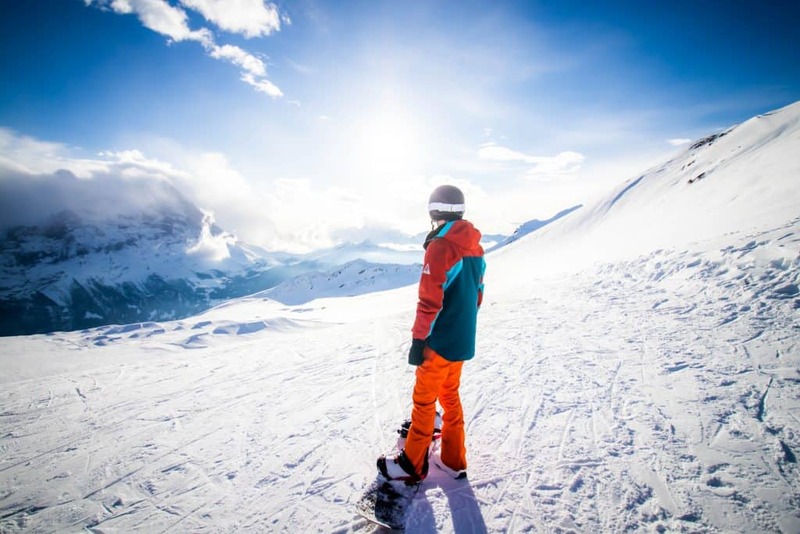 Don’t worry about bringing the gear as you can easily rent a helmet, goggles, and sled if need be. A number of shops in the villages offer rentals as well as ski shops at the top of Kleine Scheidegg. If you rent your sled at the top of the mountain ask the shop beforehand as many allow you to ride down and drop the sled off at the train station. We highly recommend giving sledges a try as they’re a blast for everyone. Hint* The metal sleds go much faster than the plastic ones. There is no shortage of places to go shopping at in the region. It’s one of the main pass times for those who are not hitting the slopes. Of course, style plays a pretty important factor in your winter weather gear! If you’re looking for that perfect photo on top of a mountain you need to look your best. 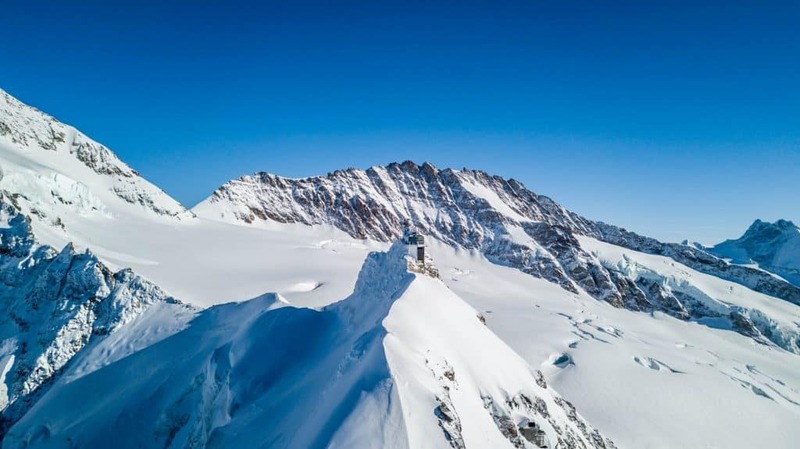 For those who like to keep their feet firmly on the ground, there are a countless number of hiking trails around the Jungfrau region that are open year round. While wintertime trails are limited they still have a number of groomed trails that allow for wonderful winter hikes in skis, snowshoes, or even hiking boots. 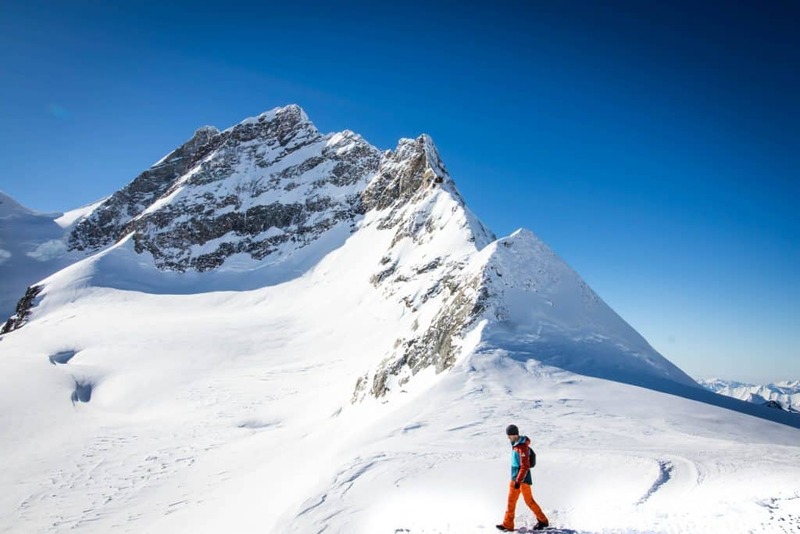 There are 18 snowshoe trails to explore from Grindelwald. Almost all of them are sure to provide stunning mountain views in a serene Swiss valley. You can check out this site for information on the snowshoe hikes in the area. We didn’t give snowshoeing a try in Grindelwald or Jungfrau as we were short on time, but have tried it in the past and love how close you get with nature. It doesn’t matter what you’re doing or where you are in the region, but the views are going to be breathtaking. There is a good reason that Jungfrau is one of the most popular spots in Switzerland. It’s for the jaw-dropping mountain views, so make sure to bring a good travel camera. If you want to brave your fear of heights then take the Gondola up to the Cliff Walk. It’s a death-defying structure that allows visitors to walk out on a cliff with nothing below. First Cliff Walk lies at the top of the Grindelwald First Gondola and is open year round. If you’re looking for the best view in the region you may have found it – just don’t look down! The train ride and top station have been attracting tourist since 1800s. In fact, it was first constructed due to the demand from the English aristocracy seeking to venture higher and higher into the mountains. An idea that was first thought of as hair-brained was dreamed up by Adolf Guyer-Zeller. He lived to see his idea through and began ferrying passengers up to the top of the mountain range. The mountaintop now offers a full visitor experience. There is a museum, walking trail, chocolate experience, restaurant, ice cave, and one of the best views in Europe. The amazing structure at the top is called the Sphinx and looks straight out of a James Bond movie. Sure, it may be one of the most touristy things to do in Switzerland, but there is a good reason for that!